The keen-eyed among you may notice (at the cost of great eye strain) that the Furies' background has been revised - while I remain happy with the basic concept, there were details that in hingsight I felt could be improved, so I took this opportunity to recreate the chapter. 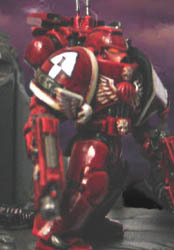 Among the obvious changes are the new bone-coloured trim on the armour, the 'rifleman' variant shoulder armour, the new and far more complicated to paint chapter icon (based on a Boris Vallejo artwork), and the gene-seed is now listed as Luna Wolves (! 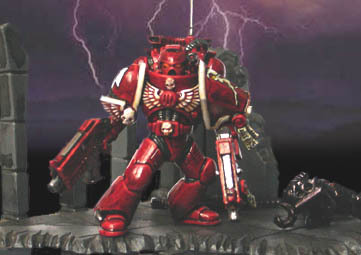 ), rather than Ultramarines. Hopefully, one day I'll have time to sit down and write up the new version of the background in full. 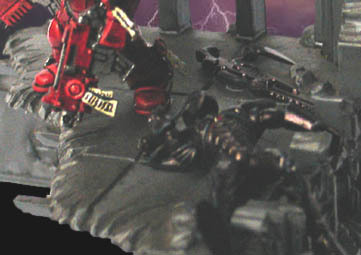 I also completed the sample miniature of the new Furies, along with a scenic base comprising a piece of gothic ruin (the standard 40k scenery) and a dead Dark Eldar. 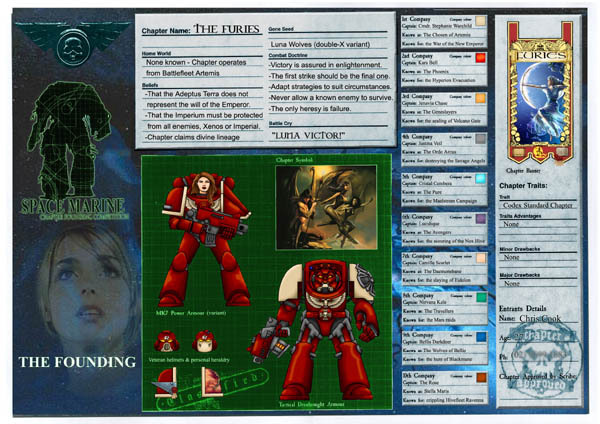 The Marine was the same concept I used years ago for the first Chapter Founding competition, a 'comms marine'. Her backpack was created from a standard Marine pack and an Eldar Guardian torso back, both filed to fit together. The antennae were old WWI miniature rifle barrels, the left-handed bolter was left over from a metal vetaran sergeant, and the new shoulder pad was created using the plastic armour left over from an old plastic-metal Chaos Biker.